Scratch resistant sapphire crystal Cyclops lens date，aser crown trademark on Six Clock，corrosion-resistant rotatable ceramic bezel’s numerals and graduations coated in gold，legible display with blue luminescence. DIAMETER: 40 MM, Thickness: 13MM. 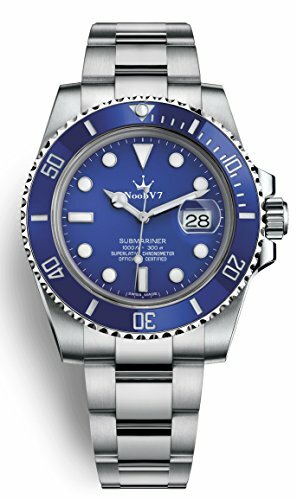 The Version 7 V7 carried Japanese Miyota 8200, Accuracy per Day -24 to +60 sec.POWER RESERVE：approximately 24 hours; WATER RESIST: Only daily home life not suitable for swimming or bathing. 316L stainless steel Brushed Solid link flat three-piece links bracelet and Crown safety folding CLASP with Extension system. Please Attention that,The words on dial is not show noobv7 and The V7’s package without original wave wooden green box, for the original box need extra 40,If you like more better version V8 V9.904L stainless steel cal.3135 movement.Please view our store, or contact us to inquiry more details. The Version 7 V7 carried Japanese movement, Accuracy per Day -24 to +60 sec.POWER RESERVE：approximately 24 hours; WATER RESIST: Only daily home life not suitable for swimming or bathing. 316L stainless steel Brushed Solid link flat three-piece links bracelet and Crown safety folding CLASP with Extension system.